Passenger information display specialist Infotec is delighted to see that several stations in which its systems have been deployed have been successful in the National Rail Awards 2017. The acclaimed panel of award judges, that included John Swift QC, who served from 1993 to 1998 as the UK’s first Rail Regulator, and Anthony Smith, Chief Executive of Passenger Focus, made several references to passenger information systems in making their assessments. Speaking of Manchester Piccadilly, which was highly commended in the Major Station of the Year category, the judges said that “its extensive passenger information systems” are of particular note. Both Manchester and Blackfriars (pictured home page) benefit from passenger information display systems designed and manufactured by Infotec. When the Thameslink Programme, designed to improve north-south rail travel through London, was being planned, Network Rail recognised that to help minimise how long it takes customers to get on trains, information about services needed to be presented along the length of the extended platforms, including those at Blackfriars, to encourage passenger spread. Infotec worked with all parties involved to devise an innovative solution that it could deliver as a result of its expert in-house designers, software engineers, manufacturing capabilities and test facilities. 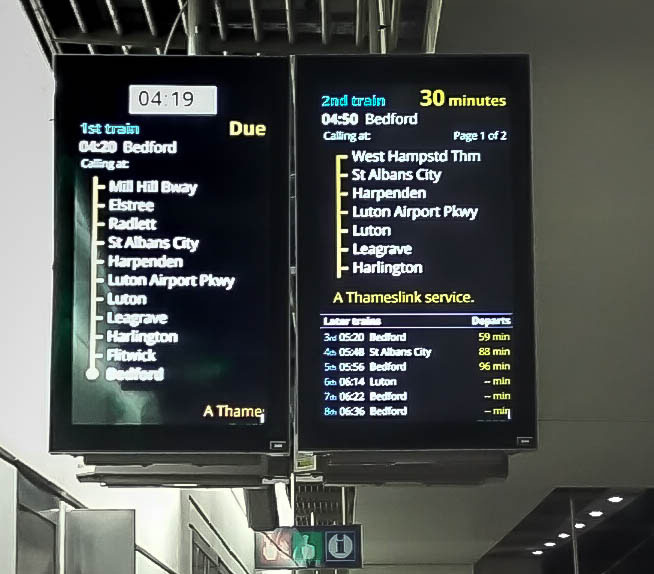 As a result, TR42P TFT displays have been mounted as pairs with the “master” providing details of the next train and the “slave” showing the second and subsequent trains due. The two displays work as one. They include train formation pictograms and vertical scrolling information. The displays, which have an important role in passenger management as well as in customer satisfaction, are now fully operational at Blackfriars, Farringdon and Thameslink (pictured news pages) stations. Infotec also continues to work at London Bridge, another of the stations being overhauled as part of the £6.5bn Thameslink Programme. The two stations which were highly commended in the Large Station of the Year category, Birmingham International and Derby, have also had new displays by Infotec installed over the past year. Commenting, Infotec Managing Director Tim Court says: “We congratulate the winners and those highly commended in the awards and are particularly pleased that we have been involved with so many of those that featured.